Our recycled rubber tire mats are made from a variety of recycled materials including used conveyor belting, recycled tires and hydraulic hoses. Each mat is held together with galvanized steel rods to ensure these mats don’t rust or fall apart. In fact, these mats are so durable, they’ll out last your house! Unlike other rubber tire door mats, we decided to inject some color into our designs. We currently stock a variety of mat colors. We have two standard sizes available, 17” x 32” and 24” x 47”, but we make custom size floor mats up to 4’x6’ (48”x72”). 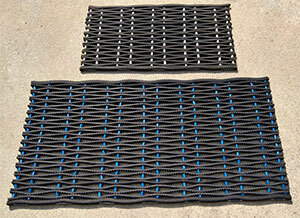 Atlas Belt’s rubber tire link mats can be used indoors and outdoors for a variety of matting purposes. Looking for that perfect accent floor mat that separates you from the Jones’s? These repurposed floor mats are the perfect conversation piece for anyone stopping by. Each one of our entrance mats are hand made using a variety of repurposed materials including conveyor belts and hydraulic, water, and air hoses. Place one of our mats outside your RV, motorhome or tent and you will no longer track all the dirt and sand from the campground inside. The debris is scraped off your shoes and simply falls through the mat. These mats are tough enough to withstand the heaviest of livestock’s daily use. Dirt and debris simply falls through the mat. To clean walkways, simply lift the mat sweep or power wash the dirt away and lay the mat back down. As parlor mats, liquids flow away underneath them to ensure workers do not slip and fall. The parlor mats can be easily hosed down for cleaning and will last years. Unlike plastic parlor mats, you don’t have to worry about these rubber parlor mats breaking if something is dropped on them. 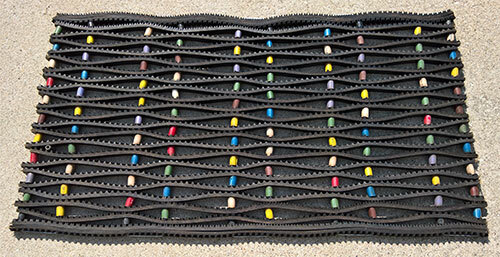 Being made from recycled rubber materials these mats also provide great anti-fatigue benefits. Protect the bed of your truck with these heavy-duty recycled tire mats. You don’t need to worry about these mats dis-figuring with heavy loads. These mats can handle everything you pile on them. Our recycled tire mats are perfect for your wet applications. They will keep your feet or products dry while allowing water to freely flow underneath the mat. We are always learning new purposes and applications from customers using our tire mats. We’d love to hear from you! We welcome all pictures and stories and often feature them on our site.